Really nice builds, N3434V! 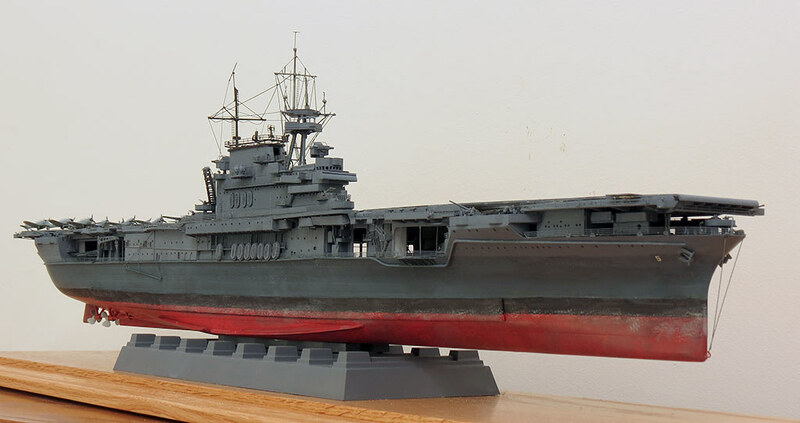 I once used to built 1/72 scale models, but my last one was 8 years ago. 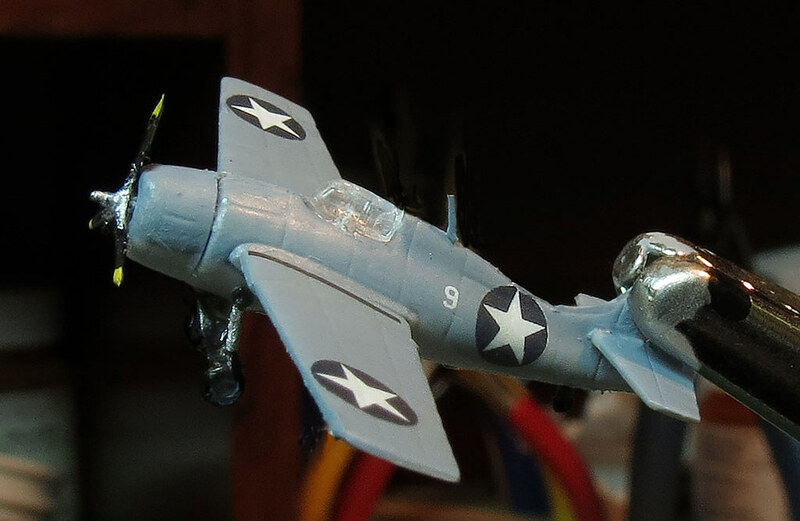 I was specialized in IJN and IJA WWII aircraft, altough I've made a Brazilian Air Force P-47D. I still have lot of kits to start and finish, but haven't enough time and inspiration to be back to work...add to that my paints were left in Brazil since my moving to Italy and I don't have funds to purchase again those 100+ paint cans again. 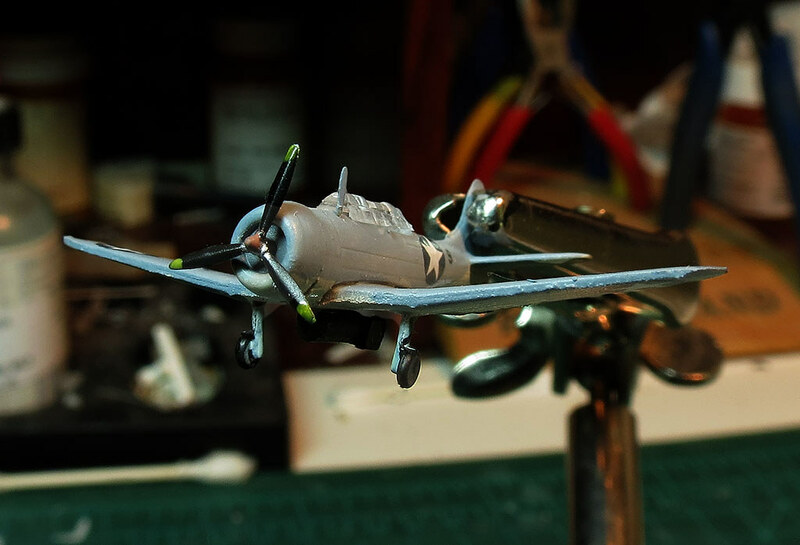 Some of my works are published in this forum, including my yet-to-be-finished A6M2 Zero. The kits will be there when you are ready to start-up again. Moving to a new residence caused me to pause building once or twice. Then I always started building again. When you are ready, just get supplies to build one kit. If that build goes well and you have time to begin another one you will soon be right back into it. That's the nice thing about hobbies, there is no hurry. Fantastic work! That Lear-jet looks stunning. I thought I'd post several photos from a kit project I completed a couple of years ago. 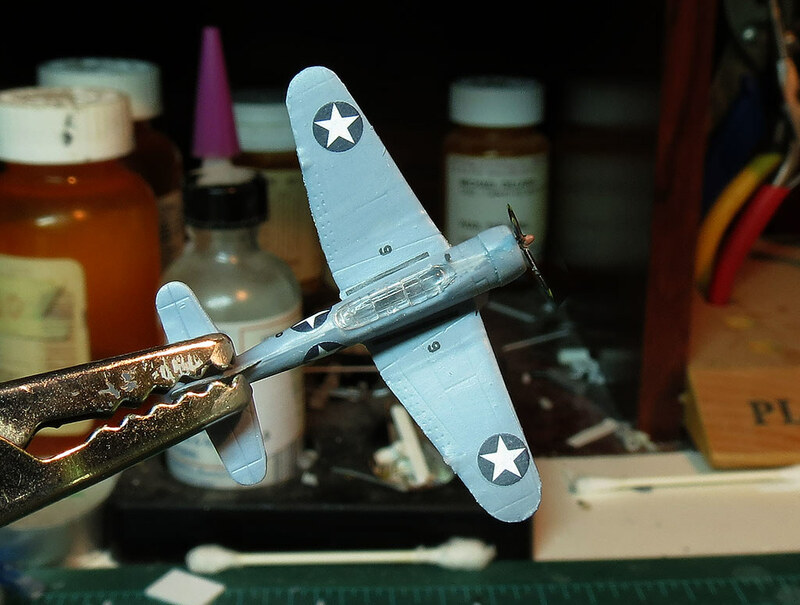 While not 1:400 scale, these aircraft are 1:350 scale (close!) 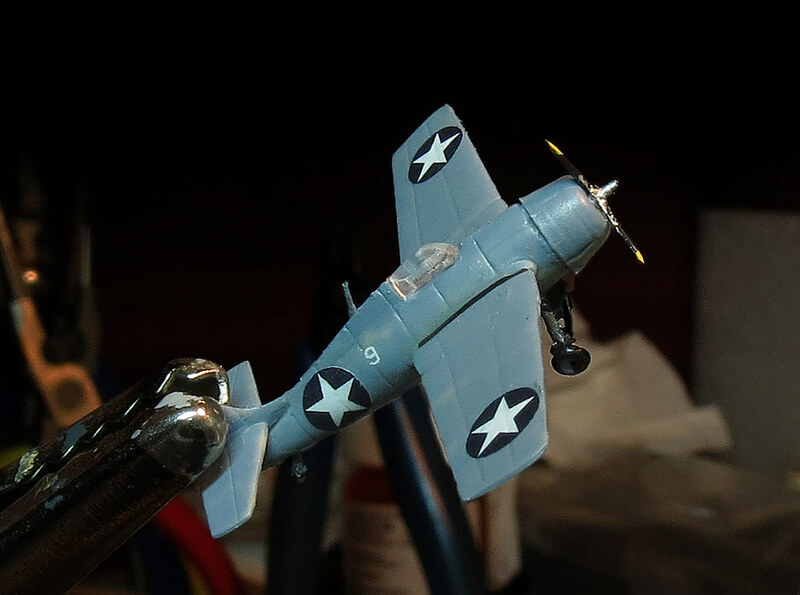 models of a F4F Wildcat and a SBD Dauntless I built for a model of the aircraft carrier USS Yorktown (CV 5). They were spotted on the carrier deck representing the ship's appearance on the morning of 5 June, 1942 at the beginning of the battle for Midway. 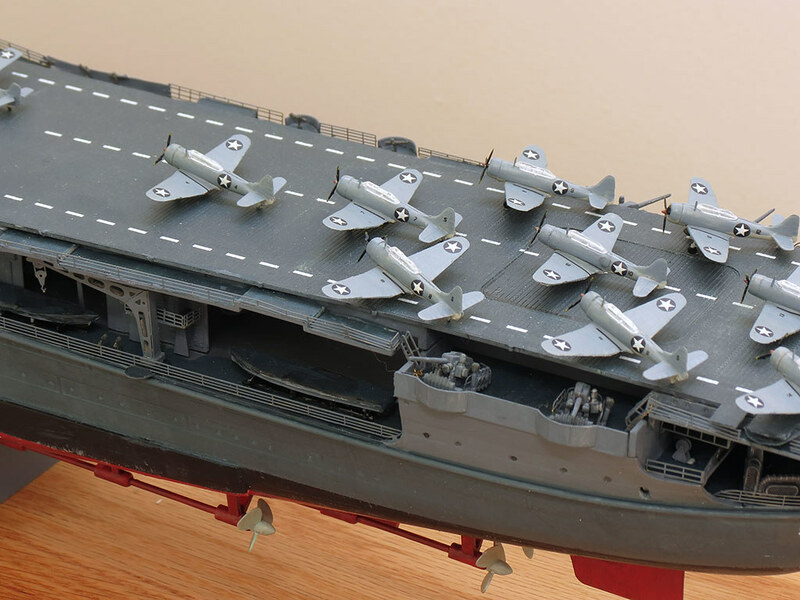 Shots of the carrier model. Once you get your mind set to working small, everything falls into line. It does make me respect the 1:400 and 1:500 scale airliners much more. PT, Vince, thanks very much. Vince, I've never personally been in favor of people figures on ship models. Too often I've observed model viewers exclaiming "Look at all the little people!" and missing the whole model entirely. I imagine it is the same with scale airports. Thanks to both of you again. 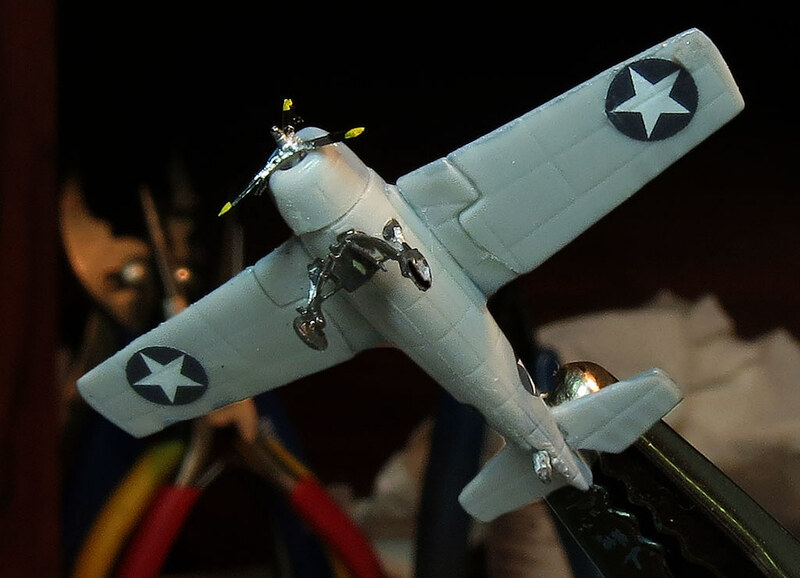 Taking a break from mish-mashing, I recently completed the Airfix 1:72 C-47 kit by modifying it to a post-war DC-3. 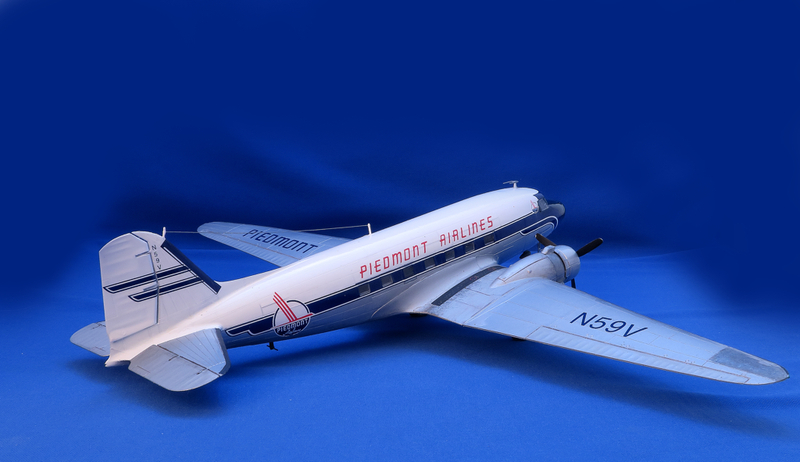 I am just old enough to remember Piedmont DC-3s at the regional airport where I grew up in western Virginia, USA. Piedmont was a very successful regional airline in the southeastern US until merging with US Airways in the early 1980s. The airline went from DC-3 service throughout the area expanding to turboprops and finally using B727-100s, -200s and 737-200 aircraft. The airline had grown to include B767-200ER service to London Gatwick until the merger occurred. These quick and dirty photos show a model that gave me several problems during construction. While the kit is new, there were some fit issues that kept the project from being a fun one to do. The project was to show a day-to-day working regional bird with a polished metal surface that put up with piston engine exhaust discoloration etc., as part of the daily work. There is a museum bird in this livery in flying condition with plenty of available reference photos available. Being a museum bird though, the polished metal is maintained far beyond what the in service fleet would have been back in the day. 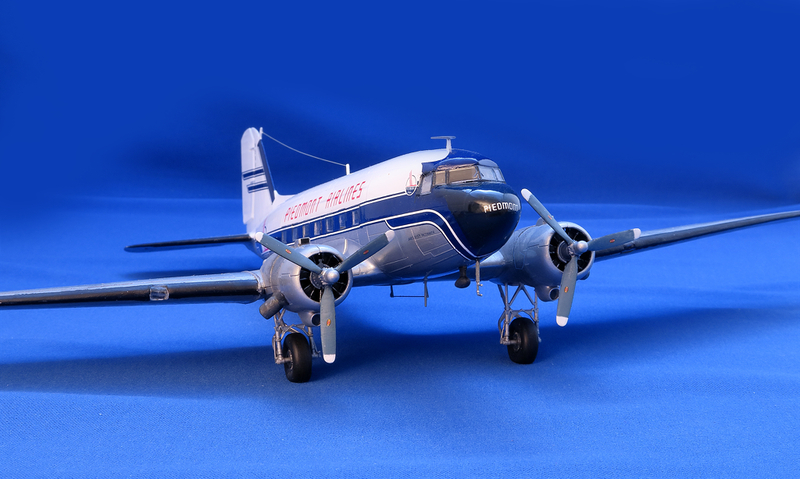 Plus, being a flying bird, it is covered with modern communication antenna which isn't helpful when the model is to represent a 1950s-60s DC-3. 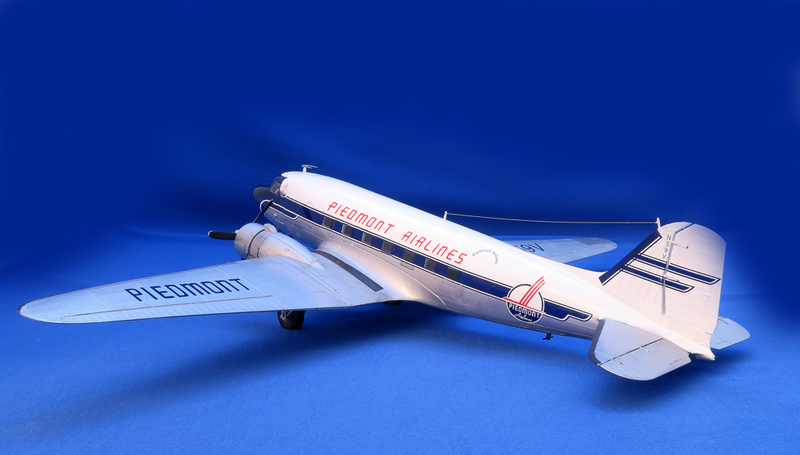 Good period photos of Piedmont DC-3s aren't plentiful, so she of the detail work is a bit of guess work. I weathered the engines and the wings near the nacelles. I didn't dirty-up the plane as some of the old photos showed, but it isn't as clean as a museum bird would be. Sorry about the rough background work in the photos, but I wasn't motivated to press the wrinkles out of the background cloth for photographs of a less than satisfactory project. Still the model will make a decent display. Let me know if you have any questions about the kit and construction. Last edited by N3424V; 03-03-2019 at 02:58 PM. It is hard for me to overlook the flaws on this one, but I imagine the model will look better as time passes. I'd read some good things on the Airfix kit, so I looked forward to the project and had grand visions of the outcome. Kit projects rarely meet those imagined "grand visions" of the completed model, but this one missed the target more than most of my attempts. I'm glad you liked it and thanks again.